Brad Pitt has filed for joint physical and legal custody of the six children he shares with Angelina Jolie. Jolie, on the other hand, has applied for sole custody of the kids, meaning the legal battle between the two is heating up. Neither have mentioned in their court filings whether they are seeking spousal or child support. 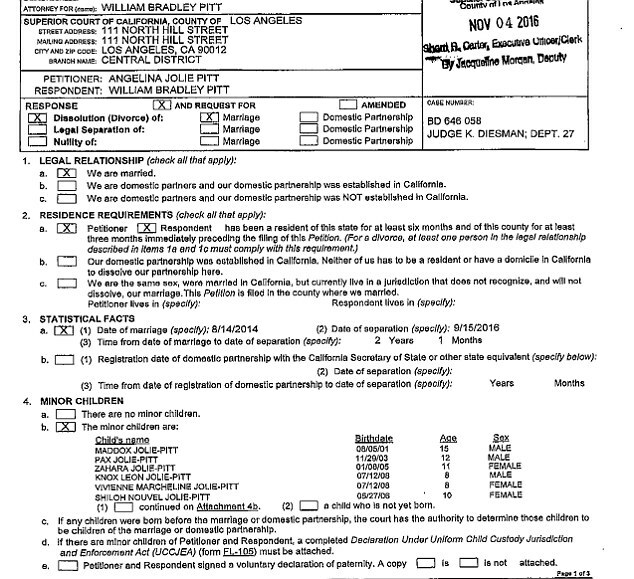 DailyMail.com reports papers seen by them were filed in the Superior Court of California, Los Angeles, on Friday. same separation date, September 15. He then lists his children - Maddox, 15, Pax, 12, Zahara, 11, Shiloh, 10, and eight-year-old twins Knox, and Vivienne - and puts down that he is seeking joint custody. Jolie filed for divorce in a Los Angeles court September 19. In the filing, she said she separated from her husband on September 15 – a day after the couple and son Maddox were involved in an alleged altercation on their private plane. Pitt has been accused of physically attacking Maddox while drunk. Child services in Los Angeles have launched an investigation into what happened. The FBI has said it is gathering information before deciding whether to launch a federal probe into the allegations. They interviewed Jolie for four hours after the alleged altercation, according to reports. The actor has denied the claims. Reports initially suggested that Pitt was seeking joint custody, and wanted to avoid a court battle. A source recently told People that the pair were still trying to iron out differences during their acrimonious split. When they weren't acting, the couple were seen as devoted parents and global philanthropists, creating a joint foundation in 2006.